It was courageous travelers and early traders who carried the message of India’s wealth to the distant shores of Europe and East Asia. Buddhist pilgrims and scholars from both the west and east journeyed into South Asia 2,000 years ago, to study Buddhist philosophy and to visit the sites associated with him. Such diverse interests in religion and commerce created an image of an India rich in resources of timber, minerals and precious stones, of skilled artisans who crafted the finest textiles, jewels and household artefacts, of gurus, teachers, mathematicians and scholars, hermitages, universities and glorious cities. It was the lure of this wealth that opened up trade routes along the shores of India and through the Himalayan mountains. In the early years of the Christian era, Arab traders had established contact with India and East Asia, bringing them closer through the exchange of ideas and innovations. With the birth of Islam in Arabia in AD 622, power and conquest followed these vital trade routes, encompassing the distant lands of Spain, Africa, Middle and Central Asia, China and Java. Once again, India was linked to other countries by a subtle network of ideas stemming from the theology of Islam, politics, trade and sociology, bringing about a complex synthesis of technological innovations and culture. 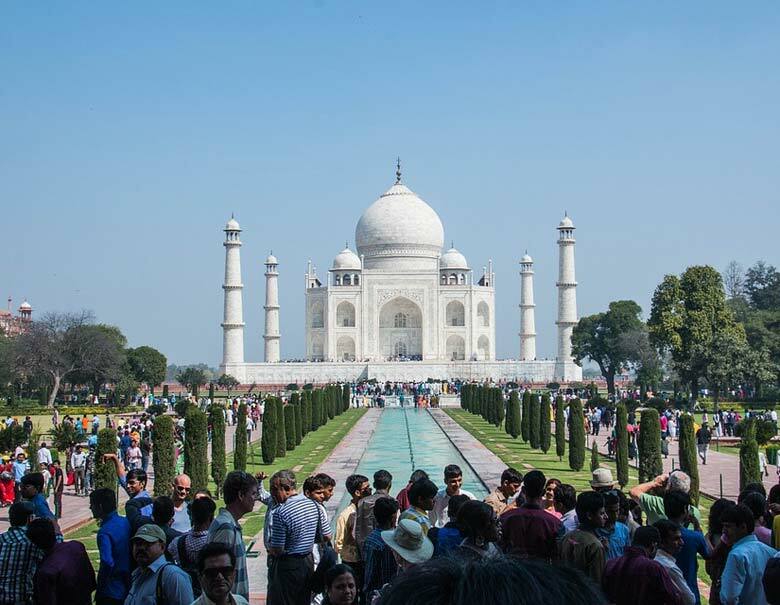 Information on Golden Triangle Tours in India and Delhi Agra Jaipur travel guide. Indo-Islamic art, growing and flowering over many centuries, retained in essence its international link while acquiring a flavour that is unique to India. It was nurtured by both highly skilled indigenous artists and artists brought from the Central Asian and Iranian courts. A place for prayer Central to Islamic belief is communal worship, and for this the new settlers in India required appropriate sites. There are three kinds of mosques or masjids which serve the need for prayer and prostration before Allah: the Id-gah for mass congregation during Id and religious festivals; the mosque for Friday mass worship, called Jama, Juma or Jami Masjid; and for private prayer five times a day, a small space where on the prayer rug one could kneel facing Mecca and the Ka’ ba, the axis mundi of Islamic cosmology. Since worship of images is prohibited by Islam, the little carpet, a portable mosque, was a treasured item of religious ritual. The art of carpet weaving developed in the Middle East, Iran, Afghanistan and in India, and produced a wide range of wool, silk and cotton prayer rugs to serve the needs of all worshippers. They are embellished with decorative borders and, sometimes, calligraphic quotations from the Quran. A mosque consists of an enclosed courtyard with a central wide open area for prayer. One wall of the courtyard is aligned to point towards Mecca, to indicate the direction of prayer. This wall, called the qibla, is given prominence by the construction of a carved niche called the mihrab, with borders of Quranic calligraphed verse. In the open courtyard in front of the qibla is a tank or fountain for the ritual washing of hands, feet and face before prayer. The first mosque of this kind to be built in India was the Quwwat-ul-Islam (“Might of Islam”) in 1192, attributed to Qutb-ud-din Aibak. 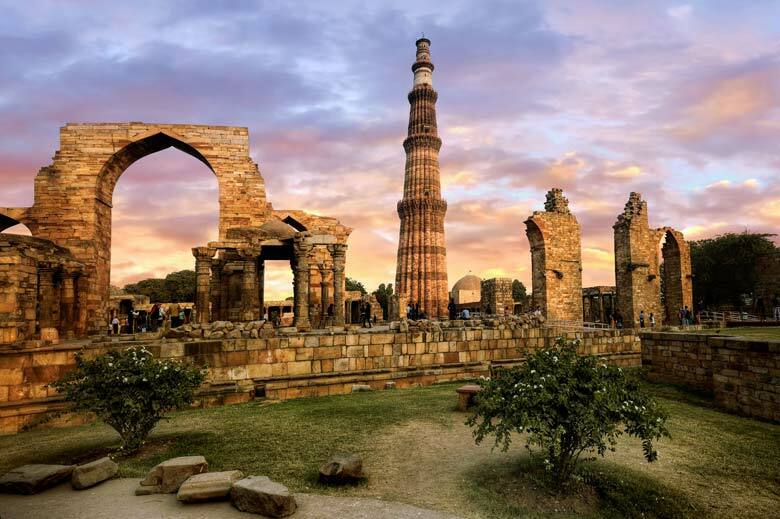 The Qutub Minar was constructed by him beside the mosque which, although built as a tower of victory, became the model for all subsequent Indian mosque minarets. The minar is an essential feature of all mosques and served as a high tower from which the muezzin or priest traditionally called people to prayer. A mosque could have either a single minar, or two, or four, to lend a symmetrical balance to the structure. The evolution of the design for the minar in the Middle East, Cairo and Iran can be traced from simple square towers, to elaborate circular, many-sided constructions. The next problem that confronted craftspeople was the construction of an arched prayer hall for the qibla wall. The engineering principle of the arch was a technological innovation brought by Islam to India. For the first time the bridge between two walls or pillars did not have to be limited in span by the use of single stone or wooden beams. With the use of the arch-wide openings, tall broad doorways and windows were possible, which transformed construction. 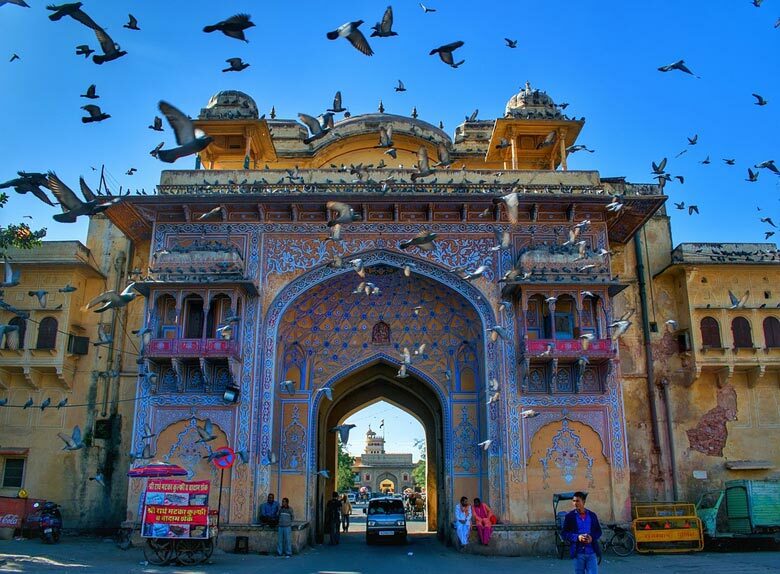 Local artisans were initially hesitant to use the arch, and often supported it with beams and brackets, or even filled up the archway, creating a mixture of Hindu and Islamic building styles. In time, arches and domes lost their tentative form, acquiring lofty heights and spanning wide areas to create airy buildings full of muted light, which became the signature of Indo-Islamic architecture. The increased confidence of the architects is reflected in the later mosques built at Fatehpur Sikri by Akbar, and the private royal mosque for daily prayer, the Moti Masjid, built by Aurangzeb at the Red Fort in the 17th century. The perfection of building technique, the restrained use of decoration, the indigenous lotus design, Islamic inlaid calligraphy and the reposeful symmetry of the domes and arches of the Jama Masjid, in Delhi, represent the high point of mosque architecture in India, the culmination of an artistic endeavour pursued over centuries. As in Christian belief, Islam speaks of Judgement Day, when the souls of the dead will be divided according to their deeds and sent to hell or to paradise. Throughout the Islamic world the dead were buried in graves aligned to face Mecca, with sometimes a low tombstone raised above the ground and covered only by the “canopy of the sky”. Later, for important tombs, the metaphor of the “canopy” was converted into cloth hangings and masonry domes. Tombs of saints and poets were included within the mosque complex to serve as pilgrimage centres; to visit them was to commune with the spirit of goodness and faith. These tombs attracted hundreds and thousands of pilgrims of different faiths, and to this day, these dargahs or mausoleums resound with devotional music (qavvalis), recitation of prayers and the bustle of people. To celebrate the life of the saint, the annual Urs (anniversary of the saint’s death) and religious festivals were arranged at the tomb. The tomb of the 13th century saint Hazrat Nizammuddin in Delhi, of Sheikh Salim Chisti at Fatehpur Sikri, and of Khwaja Moinuddin Chisti in Ajmer are perhaps the most important Islamic pilgrimage centres in this region of India. Similarly, royal tombs evolved from simple square domed structures into buildings of dramatic proportions. The ruler built his own tomb during his lifetime as a monument to his life and deeds. The raised grave was placed in a bare room, where devotional music and recitations of the Quran were held throughout the year. Often a false grave was placed at ground level and the real grave within a well-guarded chamber underground, so that no one could defile the body of the king. The tomb was surrounded by a garden and often enclosed within a boundary wall, so that entrance could be restricted to family members and friends. Often a mosque was built on the western side for prayer, with a complementary building on the east to provide symmetry to the plan. The poetic metaphor for paradise was the surrounding garden, full of sweet-smelling flowers, evergreen trees like the cypress, with the gentle sound of birds and the continuous gurgling of life-giving water. The theme of gardens, with floral motifs, is repeated in the architectural decorations, textiles and carpets of that period in the Islamic world. The plan for the tomb building was first square and later octagonal. 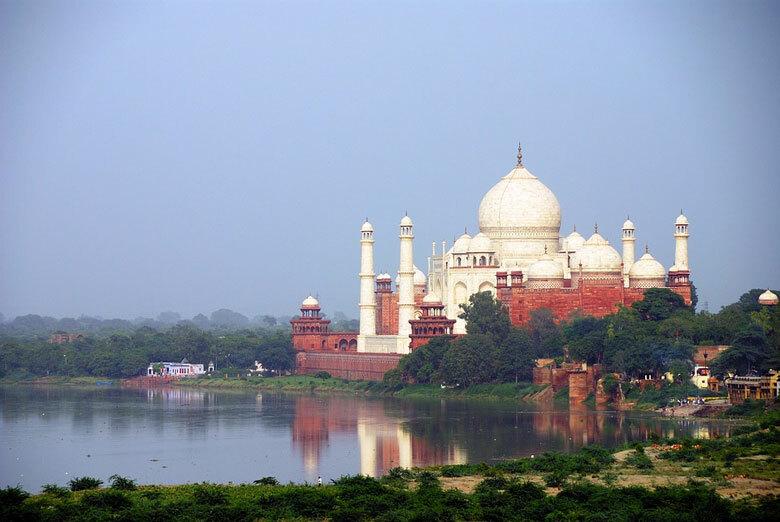 These features are combined in an irregular octagonal plan in the Taj Mahal and in Humayun’s tomb. The roof over the tomb was usually a dome, with the exception of Akbar’s tomb at Sikandara and Itmad-ud-Daulah’s tomb in Agra. 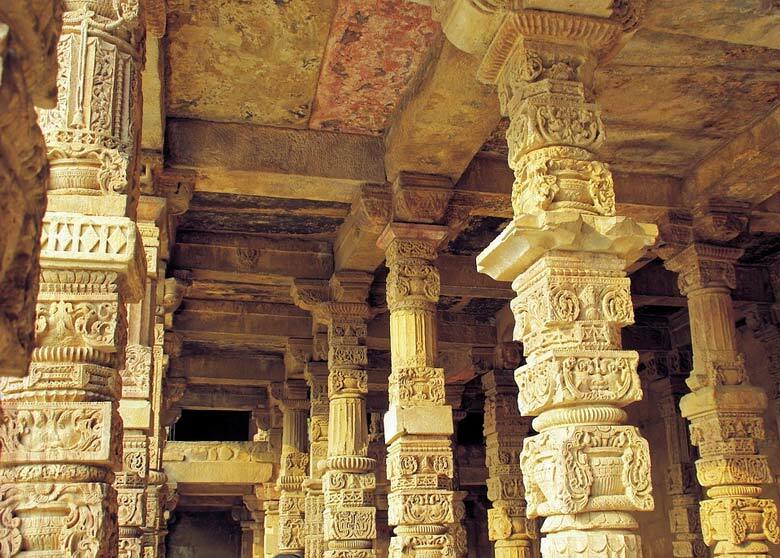 Akbar used the Hindu architectural design of carved pillars supporting flat roofs, stone beams, overhanging eaves, and brackets, similar to his Panch Mahal in Fatehpur Sikri. The structure is light and airy, with open halls supported by pillars on several storeys. The tombs, like the palaces, were built of rubble covered with smooth plaster work, and stucco designs that were either painted or inlaid with ceramic tile patterns. 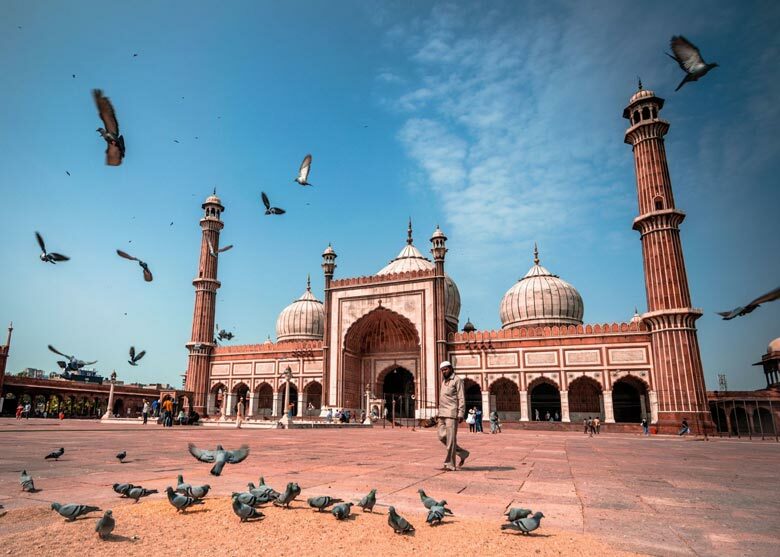 In Islamic structures in Delhi from the 13th to the 15th century, artists used coloured tiles to create borders and panels on gateways and arches in accordance with the artistic heritage from the Middle East. Local pink sandstone and white marble created colour variations in the decorated facades of buildings. Ornamentation in geometric forms, squares, circles and interlocking shapes, existed side by side with arabesques of creepers flowers and trees that seem to have been inspired by paintings. The juxtaposition of red sandstone and white marble created a pleasing visual effect and, since a variety of stone was available in plenty in India, it gradually replaced tile work and became a distinctive feature of Indo-Islamic architecture. In the tombs of Ghias-ud-din Tughlaq and Humayun, the main body of the structure is faced with pink sandstone, with the dome in white marble. Itmad-ud-Daulah’s tomb in Agra and later the Taj Mahal were faced completely in white marble, giving to these buildings a new quality of weightlessness and brightness. Geometric designs cut out from coloured marble and sandstone were joined together and set into the stone wall in elaborate patterns. Akbar’s grandson Shahjahan used pietra dura work in the Taj Mahal, but reduced the scale of the areas to be covered and introduced semi-precious and precious stones into the marble inlay. A single flower on Shahjahan’s tomb comprises more than 60 cut stones of subtle hue that a painting, the turn of the capture, as in petal, the fall of the leaf, and the stain of pollen-laden stamens. 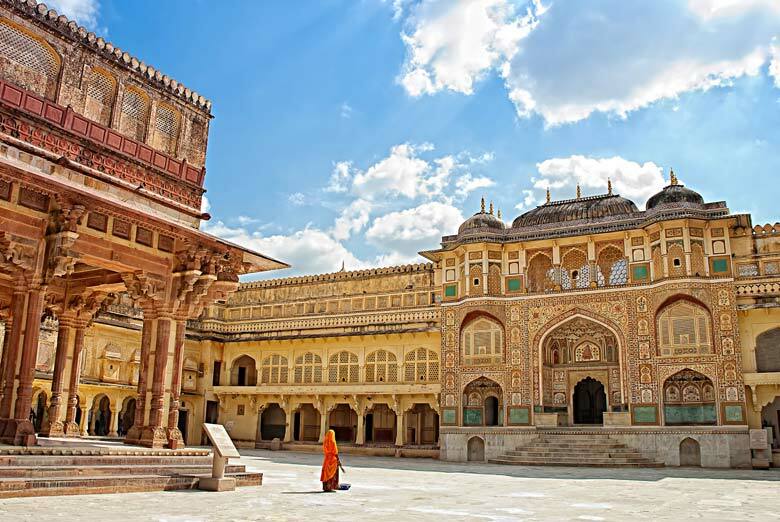 The Hindu royalty of Rajasthan were perhaps most influenced by Mughal culture, for historical and political reasons. The Hindu belief in reincarnation negates the need for tombs, but there was an ancient practice of marking the place where a warrior died or was cremated. The Rajputs therefore constructed chatris or raised open pavilions with pillars and domes to mark the place of their heroic dead. 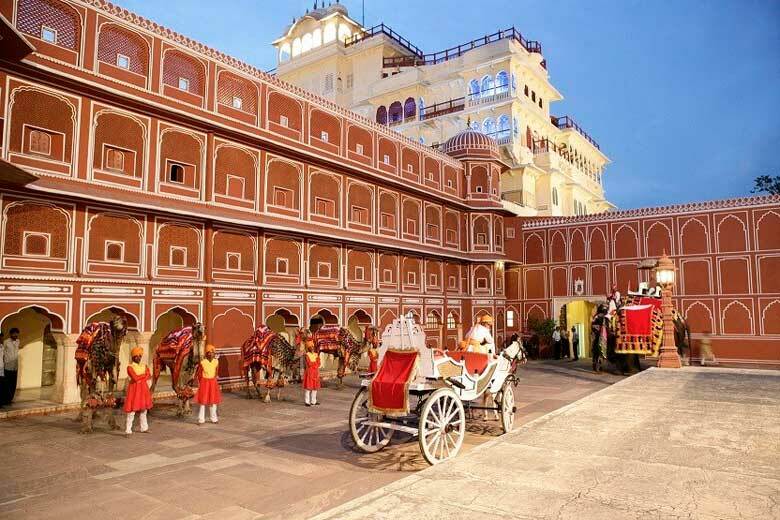 It is in the forts and palaces of Delhi, Agra and Jaipur that one gets a glimpse of the lifestyle of the rulers. The concept of the fortified palace or living quarters for the rulers embodied the fundamentals of Islamic domestic architecture: public and private areas were clearly defined, whether within a house, a palace complex or a fort. The private areas, shielded from the public eye, were placed at a distance from the entrance; like the protective veil worn by Muslim women, stone walls and screens further segregated the living areas for the family and the harem. Rooms had little furniture and hence could be used for multiple purposes. Depending on the wealth of the owner, they were adorned with cloth hangings, carpets, bolsters, cushions, low book stands with illustrated Qurans and manuscripts, and household objects that could be moved around at will. The palaces of Delhi, Agra and Jaipur are empty now, but a close look at contemporary miniature paintings helps to recreate the beauty that once furnished these buildings. Great care was taken by the architects of these palaces to build in a manner that was suitable to the climate, and to ensure comfort in all seasons for the occupants. Delhi, Agra and Jaipur share a common climate — torrid and dusty during the summer months — and rooms were built with thick walls for insulation and large windows and doors for cross ventilation. The intense summer sunlight was diffused and scattered by the use of stone lattice screens or jalis. Perfumed water was sprayed on cloth and grass mats hung across openings to cool the interiors. In the Red Fort in Delhi, there were fountains within the building and the gardens around it to cool the air. There are not many buildings within these forts as the Mughals, perhaps because they were accustomed to an outdoor nomadic life, built relatively few permanent structures within the forts, preferring colourful tents and pavilions in the gardens where they could enjoy the cool perfumed evenings of summer, and the warmth of an Indian winter’s day. As well as the colour and sparkle on their buildings, they embellished their clothes with gold, silver and gem sequins. Their rooms glittered like the star-studded night sky, with the use of glass and mirrors that caught the multiple reflections of candles and lamps, as in the Shish Mahals in the Red Forts in Delhi and Agra, and Amber Fort. Landscaped gardens were laid out with water channels to catch and reflect the changing moods of the sky, and filled with flowers identified in Mughal paintings as irises, roses and narcissi. The whole plan of the palace was oriented towards the creation of a tranquil, luxuriant mood. Beyond the fort walls, the moat and the protective gateways lay the houses of the noblemen and other people, and the markets. 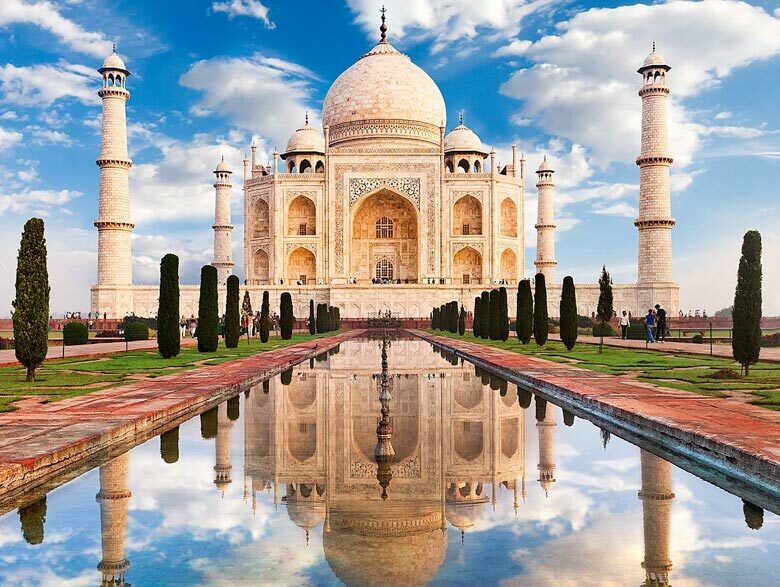 It was trade and conquest, and the protection of important trade routes by land and sea, that brought wealth into the cities of Agra, Delhi and Jaipur. These cities still retain. some flavour of the old caravan ,serais and market places. Like the souks of Damascus, each area was marked out for the sale of a particular commodity, which enabled travelling caravans of specialised traders to locate their market, find appropriate resting places and transact business. These specialised market streets still bustle with trade. Painting and Calligraphy: To these great cities of Delhi, Agra and Jaipur came artists and scholars seeking the patronage of emperors and courtiers. Amongst the most cherished objects was the handwritten book, and of all books the most honoured was the Holy Quran, God’s message tIransmitted by the Prophet Muhammad. In cities and madarsas (theological colleges) throughout the Islamic world, books were copied by of hand by generations of scribes. The art of calligraphy flourished as many styles evolved, and borders of arabesque and geometric designs were added to make each book a work of art. Earlier in India, manuscripts and holy texts had been recorded on dried palm leaves bound together by cord, also illustrated with minute drawings of figures, animals and trees. The Indian artist was thus quite accustomed to working on a small or “miniature” scale when paper, an invention brought from China, was introduced during the medieval period. The pre-Islamic and Islamic styles differed in the content of the illustrations and the nature of the painting. 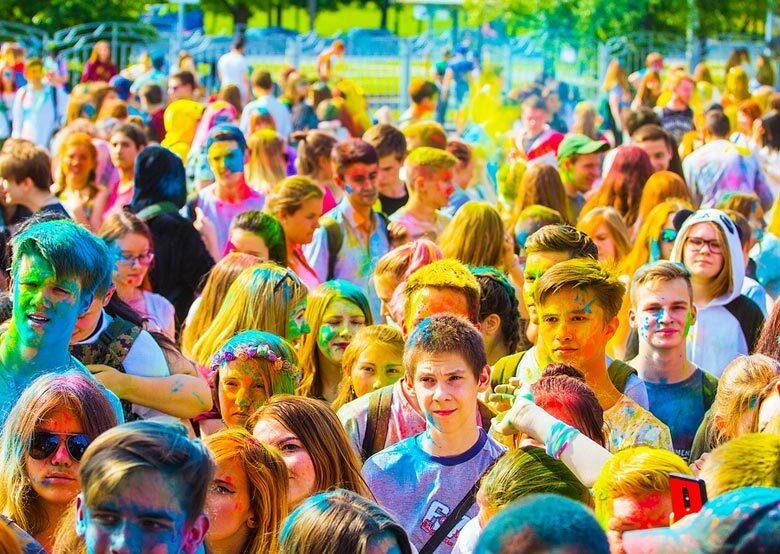 The older tradition illustrated Hindu, Jain and Buddhist texts in bright primary colours — red, blue, yellow, gold, white and black. The drawings were bold and stylised, abstract and densely symbolic. From Iran, the tradition of painting was a synthesised art form and tended to be more naturalistic and lyrical with intricate details of landscape, “Chinese” clouds, birds and animals. In the Hindu tradition, landscape and architectural details were used as a backdrop for human beings. Artists knew, but rarely employed, the rules of perspective; their focus was on the “action” of the story. 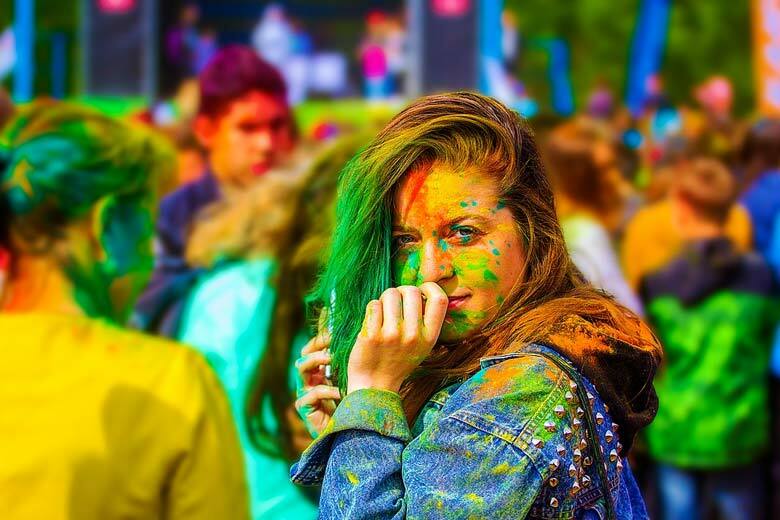 A range of brushes with camel, squirrel or even human hair was used and colours obtained from plant and mineral sources were mixed with a binding material to be applied on absorbent paper. The treatment of the paper before painting, and its polishing with a smooth stone after, were also important components of the process. Mughal emperors maintained large ateliers where several artists collaborated on works of painting and manuscripts. The Nama or royal diary was produced by each successive ruler and re-copied by his heirs. The Baburnama, Akbarnama and others were royal treasures that took years to create. The subject matter of Mughal paintings varied from illustrations of events in the life of the emperor to scenes of everyday life. Babur is said to have taken great interest in recording animals and plants that he saw for the first time in India — banana trees, the elephant and the rhinoceros, and several birds. Some of the best collections of such manuscripts can be found in the National Museum in Delhi, and the British Library and V&A in London. In the workshops of these rulers of Delhi, Agra and Jaipur, many other craft were patronised and precious jewellery handcrafted. 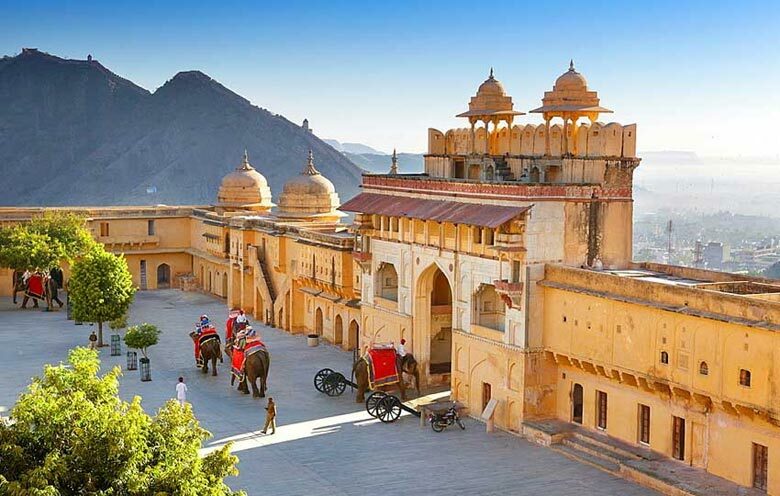 Jaipur is even today an important centre for hem cutting and for gold and silver enamel work. Jade brought from China and Central Asia was fashioned into handles for daggers, wine cups, huqqa stands and other treasured items. From various corners of the Mughal empire, textiles were brought to furnish houses and to attire the nobility: fine muslin and cotton from Bengal, woven brocade silk from Banaras, carpets and shawls from Kashmir, printed and painted fabrics from Rajasthan, gold, silver and silk embroidery from Delhi, Uttar Pradesh and the western states. Endings and Beginnings: By mid-18th century, the Mughal empire had lost much of its power, following the devastating raids of Nadir Shah from Iran. Fabulous jewels, enormous quantities of gold and treasures, including the exquisite Peacock Throne, were lost, and palaces and homes were destroyed. Delhi and Agra lost their status while the French, Portuguese and British came to colonise Mumbai, Goa, Chennai (Madras), Pondicherry and Kolkata (Calcutta). 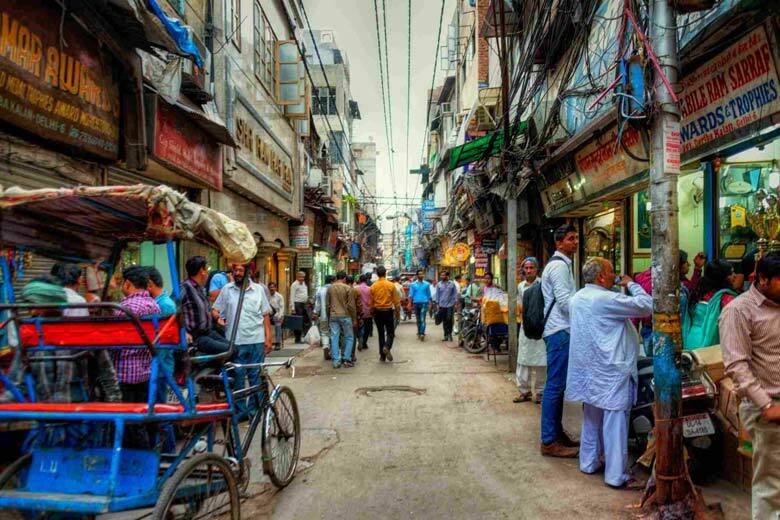 Years after the extinction of the Mughal Empire, Delhi returned to prominence when she was chosen once again in 1911 to be the capital city of the British empire in India. British architecture in Delhi is distinct from the styles in Mumbai, Kolkata or Chennai. The empire was seemingly secure, and there was an attempt to develop what was called the Imperial Anglo-Indian style of architecture. Rashtrapati Bhavan (the Viceregal residence) makes extensive use of classical Greek and Roman motifs, doric columns, archways and colonnades along with Indian elements of design — the lotus and the elephant — and extensive use of coloured sandstone. Several buildings were constructed for administrative purposes in Delhi, Agra and Jaipur — railway stations, town halls, courts, post offices, barracks and prisons. Residential buildings for British officials exhibited a mixture of Indian and European features to suit the climate of this region, with high ceilings, large windows and doors, verandahs along the sides to shade the building from the strong sunlight, and gardens and lawns with their favourite English trees and flowers. 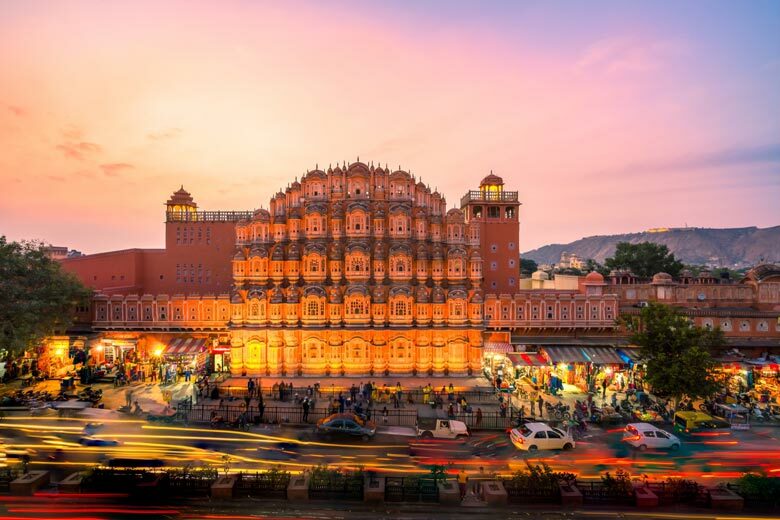 Today, the cities of Delhi, Agra and Jaipur form a gigantic collage, in which the old monuments co-exist with the new, and conservationists are anxious to preserve the the past in the planning and design of the contemporary city.